In a perfect world all hikes would be conducted in sunny dry weather, but rain and wind should never put you off from going on a hike. In rainy weather a pair of waterproof pants is a great addition to a rain jacket as it decreases the wind-chill effect and keeps your lower body dry. 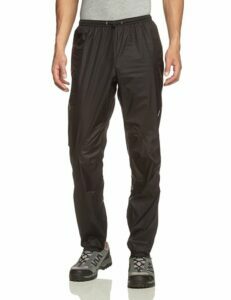 However, not all waterproof pants are suitable for hiking and other aerobic activities (trekking, mountaineering etc.). Waterproof pants for hiking should provide good breathability so that the moisture (perspiration) from the inside can pass through them to the outside. Otherwise, you might keep the rain out but anyway be soaked in your own sweat. Therefore, modern waterproof pants are made of so-called waterproof/breathable fabrics (such as Gore-Tex and Pertex). These fabrics prevent rain drops from penetrating, but at the same time allow moisture to escape from inside to the outside. In addition to breathability, hiking waterproof pants should also be lightweight, functional and durable. Here we selected and reviewed the best waterproof pants to make your buying decision a little easier. 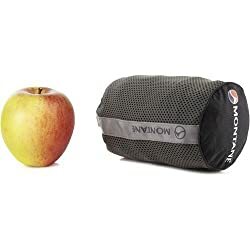 Note that all products in this review are normally worn over regular hiking pants – you only wear waterproof pants in case of rain or strong wind. 1. 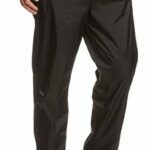 Buying Waterproof Pants – What is important? 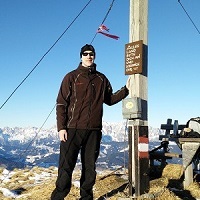 Aerobic activities such as hiking, trekking and mountaineering require lightweight gear. 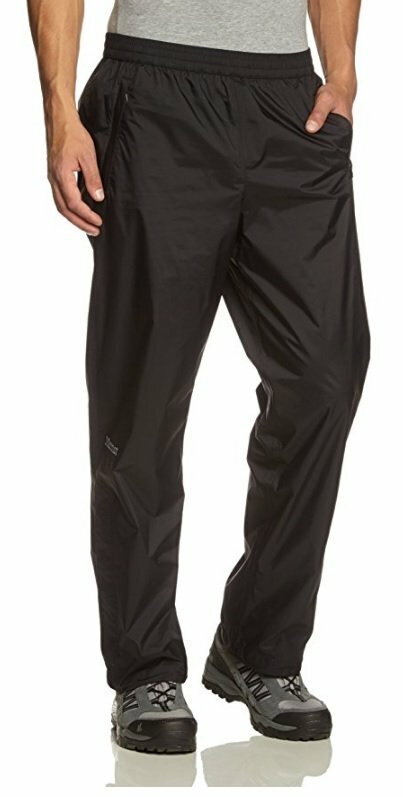 Waterproof pants are usually light, but you can still eliminate some weight by wearing/carrying a pair of particularly lightweight rain pants. Read more about why it is important to use lightweight gear for hiking in our article Why hike lightweight. As waterproof pants are often carried in the backpack and only used in case of heavy rain, it is also important that they pack small. In this review of the best waterproof pants we only listed lightweight products which pack very small. High-quality waterproof pants are made of materials that do not only provide protection against rain and wind but also breathability. However, it’s important to note that there is no such thing as a completely waterproof fabric that is also breathable; there is always a trade-off between water-resistance and breathability. Nevertheless, some fabrics offer better breathability than others while maintaining a similar level of water-resistance. Popular waterproof/breathable fabrics are Gore-Tex, eVent and Pertex. Some outdoor clothing brands develop their own high-performance waterproof/breathable fabrics, like Mountain Hardwear (Dry.Q) and Marmot (MemBrain). The level of water resistance is measured by the hydrostatic head while the “breathability” is measured by MVTR (Moisture Vapor Transmission Rate). Check out our article Rainwear: Hydrostatic Head and Breathability (MVTR) to learn more about these two parameters. Waterproof fabrics differ in construction and waterproof technology. There are two different waterproof technologies; laminates and coatings. Laminates feature a membrane that prevents liquid water from passing through from the outside but at the same time allows vapor from the inside to pass through. These membranes are typically extremely thin (0.01 millimeters) and therefore they are sandwiched between two other layers for protection. They are usually made of polytetrafluoroethylene or polyurethane. Coatings on the other hand are applied directly to the interior of a garment – a polyurethane layer is basically painted onto the interior of the fabric. As it is quite complicated to paint the polyurethane onto the fabric in an even layer, the polyurethane coat becomes relatively thick. The coating is made porous in the process of application by using an agent that creates tiny holes in it. In general, coatings differ from laminates by breathability and price. They are significantly less breathable but on the other hand they are also less expensive. Other properties such as durability and water-resistance depend more on the actual garment than on the waterproof technology. In this review of the best waterproof pants we listed three products that utilize a laminate/membrane and two products that utilize a coating. There are three different types of waterproof fabrics; 2-layer, 2.5-layer and 3-layer waterproof fabrics. Note that the layers are very thin and bonded together and thus you can’t see them with the naked eye. 2-layer fabrics consist of an outer layer with a coating or a membrane. 2.5-layer fabrics consist of a face fabric with a coating or a membrane and a non-fabric material on the inside (protective film). 3-layer fabrics consist of a face fabric, a membrane and a liner. The number of fabric layers has impact on the weight, breathability, durability and water-resistance of a garment. Garments made of 3-layer waterproof fabrics are primarily used for alpine climbing due to their superb durability. They are often very expensive. 2-layer waterproof garments are usually very cheap, but they offer very little protection against the weather. In this review we only included waterproof pants which are made of 2.5-layer waterproof fabrics as products made of such fabrics are super light and pack very small. Furthermore, they also provide good weather protection and are relatively inexpensive. For more information about waterproof/breathable materials, check out the Hardshell section in our article Comparison of Shell Materials. Waterproof pants for hiking should be equipped with taped seams for maximum weather protection. All products in this review have taped seams. Learn more about taped seams in this blog post from Trespass. Average Weight 5.4 oz. 5.1 oz. 8.9 oz. 6.9 oz. 9.5 oz. The Outdoor Research Helium waterproof pants are super lightweight (they weigh merely 5 ounces) and therefore perfect for those who prefer lightweight hiking. Furthermore, they also pack very small into their own pocket and thus take up very little space in a backpack. The pants are made of the 2.5-layer Pertex Shield+ material which features a 30-denier ripstop face fabric and a polyurethane membrane. The Pertex Shield+ material has a hydrostatic head of 20000 millimeters and breathability of 20000g/m2/24hrs which is indeed a great result. The Outdoor Research Helium waterproof pants have taped seams for increased weather protection and are equipped with ankle zippers, one zippered pocket, gusseted crotch, internal loops for instep lace and an elastic waist which can be adjusted with a drawcord. As they are lightweight and offer great weather protection, the Outdoor Research Helium pants are great for hiking, backpacking, trekking and similar activities. They are also very useful for travelling and everyday use. The Montane Minimus waterproof pants are like the Outdoor Research Helium pants made of a 2.5-layer Pertex Shield+ material and thus they offer similar water resistance and breathability. 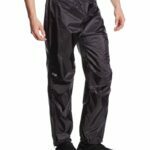 They are, however, slightly lighter than the Outdoor Research pants – they are the lightest product in this selection of the best waterproof pants. The Montane pants feature articulated knees which provide great freedom of movement when hiking uphill. They are also equipped with an adjustable elastic waist (drawcord), ¼ side zippers at the end of the trouser legs and Velcro calf tabs. The side zippers are very useful if you have to pull the pants over the hiking boots or trekking shoes while the Velcro calf tabs allow you to tighten the pants in the calf area for better fit on technical terrain (to avoid abrasion). The Montane Minimus pants are indeed one of the best waterproof pants currently available – the only downside is that they don’t have any pockets. The Marmot Precip rain pants differ from the Outdoor Research and Montane pants above in waterproof technology. 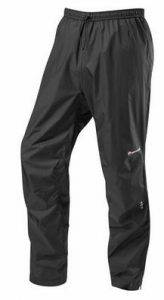 While they feature a membrane, the Marmot Precip pants utilize a coating. Therefore, the pants are slightly heavier – they weigh 9 ounces. The Precip pants are made of Marmot’s NanoPro fabric which uses a polyurethane coating along with a ripstop nylon face fabric. Marmot states that NanoPro fabric has a hydrostatic head of 10000 mm and breathability of 11500g/m2/24hrs which is indeed a good result for a coating technology. 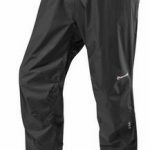 The Precip pants are also equipped with taped seams, one zippered pocket and ankle side zips so that you can easily pull them over hiking boots. The waist is elastic and adjustable (drawcord). The Marmo Precip pants are best for those who want high-quality waterproof pants for a lower price than the two previous pairs. The Montane Atomic waterproof pants also utilize a coating waterproof technology. They are made of a 2.5-layer Pertex Shield material which has a hydrostatic head of 10000 millimeters and breathability of 7000g/m2/24hrs. Otherwise the design is quite similar to the design of the Montane Minimus pants. The Atomic pants feature articulated knees, hook and loop calf tabs and an ankle adjustment system. The articulated knees increase freedom of movement. The hook and loop calf tabs allow you to reduce the pants’ volume around the calves to decrease the possibility of abrasion on technically difficult terrain and the ankle adjustment system allows you to tighten the pants against footwear to reduce body heat loss. 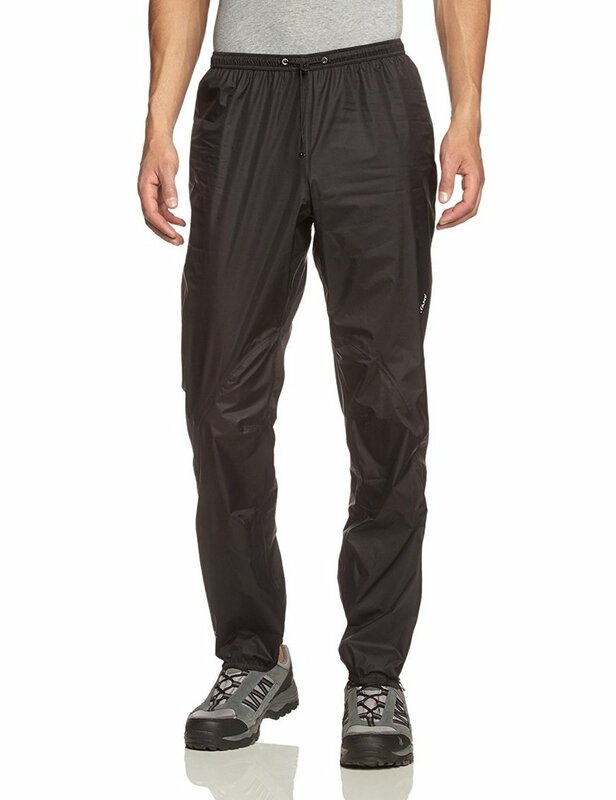 Additionally, the Atomic rain pants are equipped with high-quality YKK side zippers which allow you to regulate the temperature and put the pants on without first taking off your footwear. The main downside of the Montane Atomic pants is that they don’t have any pockets – similar to the Minimus pants. 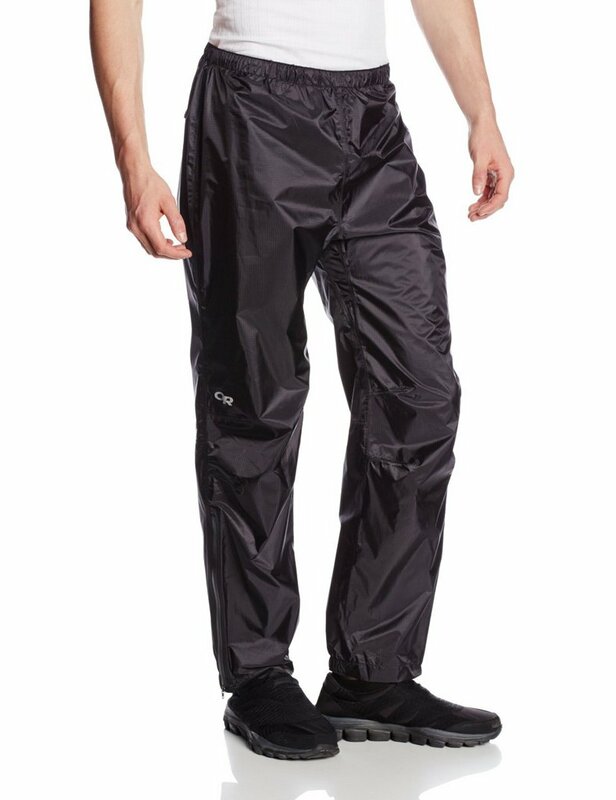 However, it is a great pair of rain pants for the price. 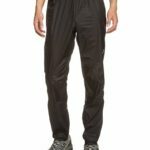 The Mountain Hardware Stretch Ozonic waterproof pants are made of Mountain Hardwear’s Dry Q Active fabric which utilizes a 40-denier nylon face fabric and a polyurethane membrane. The Dry Q Active fabric combines waterproof technology with a stretchy material and thus the pants provide great freedom of movement. The Mountain Hardware Stretch Ozonic pants are equipped with full length side zippers for ventilation. The side zippers also allow you to easily put the pants on without first taking off your footwear. Additionally, the pants feature an elastic waist, articulated knees and leg cuffs for better fit. They come with an integrated and easy adjustable belt. The Mountain Hardwear Stretch Ozonic pants are best for those who want a comfortable pair of waterproof pants for spending time in the outdoors. 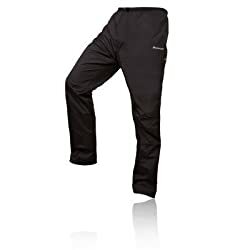 Hardshell pants (also called rain pants or waterproof pants) provide protection against rain, wind and snow while they are also breathable, so you won’t get soaked in your own sweat. Hardshell pants are typically worn over regular pants because they are made of very thin and hydrophobic fabrics. What are waterproof pants made of? 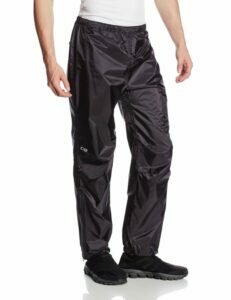 Waterproof pants are made of so-called waterproof/breathable fabrics such as Gore-Tex, eVent, Pertex etc. These fabrics utilize a membrane or a coating which allows the moisture (perspiration) from inside to pass through but blocks the water drops from the outside. What is the difference between hardshell and softshell pants? 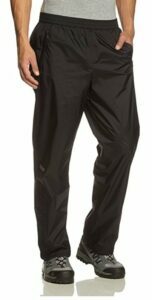 Hardshell pants provide better protection against the rain and are lighter than softshell pants. They also pack smaller. However, softshell pants provide better breathability and are more comfortable to wear – the fabric is less stiff.